Drilling There are 4 products. Flow Hammer 100 BBO is a biodegradable drilling lubricant oil (over 80% in the CEC L-33-A-93 test). 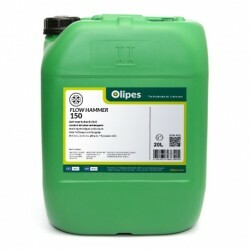 Flow Hammer 150 is a lubricating oil for pneumatic and drilling tools formulated with high degree refined mineral bases with adhesivity additives, emulsifiers, corrosion and rust inhibitors, antiwear and extreme pressure, specially selected for lubrication in drilling operations, even under severe water-washing conditions. Flow Hammer 220 is a lubricating oil for pneumatic and drilling tools formulated with high degree refined mineral bases with adhesivity additives, emulsifiers, corrosion and rust inhibitors, antiwear and extreme pressure, specially selected for lubrication in drilling operations, even under severe water-washing conditions. Flow Hammer Q is a lubricant for drilling machinery, strongly additivated with medium and extreme pressure additives. It also contains anti-corrosive additives, antifoams, antioxidants and bactericides.